Leafblower at O’Leaver’s, July 30, 2017. They’re playing there again Saturday night. I’m back from New York. Actually, I’ve been back since Wednesday. It was the usual fun of US Open (Federer won! ), Yankees (They lost!) and Broadway (Dear Evan Hansen!). As with every trip to NYC there were celebrity sightings. The first was Saturday Night Live “featured player” Mikey Day (the guy who plays Donald Jr.), who we spied sitting under a tree with a young lad (his son?) outside Yankee’s stadium prior to the game. The second was an almost unrecognizable Sandra Bernhard sitting across from me on the No. 1 train headed downtown. She got off a couple stops before 28th St. Celebrities, going about their lives like the rest of us. Anyway… looks like I got back just in time for the weekend. Tonight marks the return of Femme Fest, the annual celebration of women in rock, Omaha edition. This year’s festivities seem to have been limited to one Benson venue, the Waiting Room. The line-up: SAS, Domestica, Uh Oh, La Guerre, Jocelyn, Histrionic and Queerniverse Burlesque. The show starts at 6 p.m. and costs $10. It’s also Benson First Friday (#BFF). So if you’re in the neighborhood come on by the Little Gallery, 5901 Maple St. (bottom fo the Masonic Lodge building) and check out this month’s show: Ricky Powell Jr.’s portraits of Wonder Women of Omaha. We’re there from 6 to 9 p.m. Booze and food. Yum. Tomorrow night (Saturday) it’s back to fabulous O’Leaver’s for Leafblower with In the Whale and DROSS. 10 p.m., $5. That is all I got. If I missed your show put it in the comments section. Have a great weekend! Sorry for the outage the last couple of days. Crazy work, ya know. While I’ve been away, the fine folks of the band Uh-Oh released a new video for the tune “Songs in the Kitchen” from their latest album You’re Not Dead. The vid is embedded below. 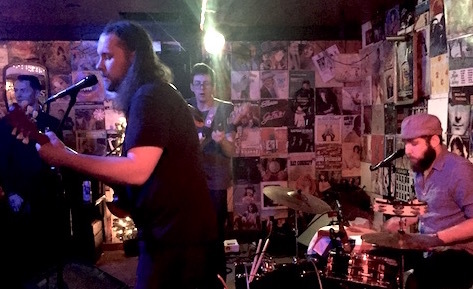 Directed by Matt Mejstrik and Ian Snyder, the video captures a night at Lucy’s Pub, 8932 Blondo St. which isn’t a pub at all, rather it’s the location for house shows, including the one captured last December in this video. Mejstrik has made videos in the past for the likes of Universe Contest, Bogusman and The Way Out. The video feels like a modern-day John Hughes movie (or at least the party sequence from one) supporting a song that sounds like sounds like a mash-up of alt country, indie and emo (Uncle Tupelo emo?). If Lucy’s Pub looks like a fun place to hang, you can find out for yourself next weekend, when the house hosts Houses Fest in conjunction with We’re Trying Records. The festival, which runs March 17-18, has a deep schedule of performances. Consider it your alternative to SXSW (which will be happening at the same time in Austin). Check out the line-up below. Entry is $5 per night, but all proceeds go to Planned Parenthood! 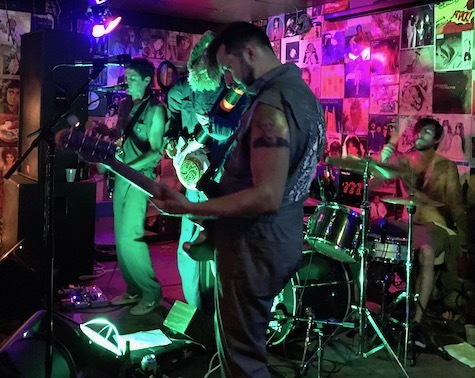 Those Far Out Arrows at O’Leaver’s, March 26, 2016. The band plays Saturday night at The Brothers Lounge. It’s been a brutal last few days. I hope to never have to speak to Network Solutions’ customer service ever again (or Cox Cable tech support, who hasn’t a clue how their own servers work). I’ll leave it at that. Tonight at The Brothers Lounge Those Far Out Arrows host a cassette/EP release party for their new one, Where Are You. It’s more groovy, psych-flavored garage rock in that Brian Jonestown Massacre tradition. The highlights are the Monkees-esque “Jump to Your Feet” and “Living Today,” which sounds like something off the first Galaxie 500 album (a reprise version of “Living Today” is Galaxie 500 crossed with The Feelies). Joining The Arrows are Lazy Wranglers and Big Slur (Dan Scheuerman of Deleted Scenes). $5, 9 p.m.
Across town at The Barley Street indie rockers Uh Oh are celebrating the online-only release of You’re Not Dead. You can get a preview of the whole dang thing below and buy your download copy here. Something about these guys reminds me of Too Much Joy, a reference that probably predates most of you (but definitely worth checking out). Joining them tonight are White Wolf T-Shirt, Skyloft and Jesse Hunter. $5, 9 p.m. Finally, there’s the massive River City Toy Drive at Milk Run tonight featuring seven bands: See Through Dresses, Cult Play, Nathan Ma & The Rosettes, Bien Fang, Jocko, Dilute and Crease. This one starts early — 6 p.m. — and is $5 or free with a new toy donation. All three sound like fun, but goddamn, why does it have to be so cold out? 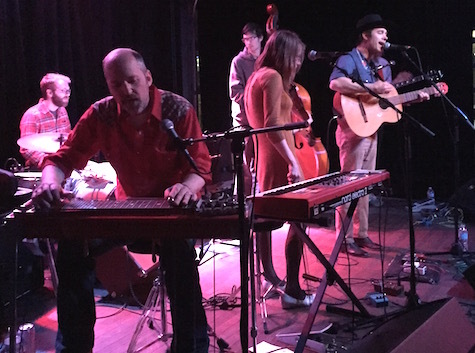 Simon Joyner and The Ghosts at Slowdown Jr., April 4, 2015. The band plays tonight at Almost Music in Benson. Time for another very special Saturday edition of Lazy-i. Hope you had an eventful New Year’s Eve/Day. 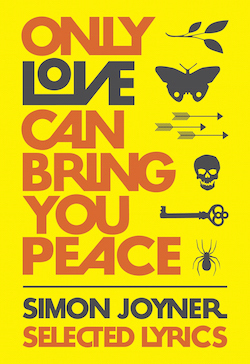 Omaha’s unofficial poet laureate Simon Joyner celebrates the release of his book, Only Love Can Bring You Peace – Selected Lyrics (1990-2014) — published by Magic Helicopter Press, tonight (Saturday) at Almost Music in Benson. It’s the first selection of Simon’s lyrics (assembled and edited by Simon and his wife, Sara) to appear in book form, showcasing the images and characters of more than 15 albums, EPs, and rare releases, according to the website, where you can purchase your copy for $16 + s/h. But why spend more when you can buy your copy at the cover price tonight at Almost Music, and if you’re really nice, Simon might even sign it for you. Joining Joyner and the Ghosts are L. Eugene Methe and The David Nance Band. Your $6 cover charge can be applied to the cost of the book. In addition, Solid Jackson Books is offering 25% off any and all additional books when you buy a copy of Simon’s book. Music starts at 8 p.m.
Also tonight, Lincoln band No Tide headlines a show down at Slowdown Jr. Opening is one of Omaha’s big surprises for 2015, Uh Oh. The band’s 5-song EP, In the Glow, was a pleasant surprise — a mix of indie, pop-punk and sing-along anthems that’s sort of a throwback to a kinder/gentler time in Omaha’s alt rock past. Slacker-rockers Mint Wad Willy kicks things off at 9. $8. Also tonight (Saturday) local punk rock legends The Shidiots play at O’Leaver’s with The Hemorrhoids and Megaton. $5, 9:30 p.m.
Then Sunday night is the big Dolores Diaz & the Standby Club show at fabulous O’Leaver’s. The country cover band’s all-star line-up includes Matt Maginn (Cursive), Dan McCarthy (McCarthy Trenching), Ben Brodin, Phil Schaffart (Con Dios), Miwi La Lupa, Roger Lewis (The Good Life), Mike Mogis (Bright Eyes) and Conor Oberst. Of course the real mystery is: Who is Dolores Diaz? You’ll just have to find out Sunday night. Indie superstar Johnathan Rice opens along with Anthony D’Amato (New West Records), who has worked with Bon Iver and Megafauna, among others. One assumes this will be a madhouse, but you never can tell. If you’re interested, I suggest you get there well before the 9 p.m. start time. Price of admission is the usual $5. 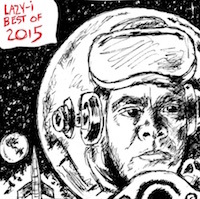 First, you must enter to win a copy of the Lazy-i Best of 2015 comp CD. The collection includes my favorite indie tunes I’ve come across throughout last year as part of my tireless work as a music critic for Lazy-i. Among those represented: Algiers, Sam Martin, Sufjan Stevens, Clarence Tilton, Beck, The Chemical Brothers, Freedy Johnston, The Mynabirds, and even the aforementioned Simon Joyner, plus lots more. The full track listing is here. Entering to win a copy couldn’t be easier, either: 1. Send an email with your mailing address to tim.mcmahan@gmail.com, or 2) Write a comment on one of my Lazy-i related posts in Facebook, or 3) Retweet a Lazy-i tweet. You also can enter by sending me a direct message in Facebook or Twitter. Hurry, contest deadline is midnight Jan. 4! Have a great rest of the weekend…and 2016…and rest of your life!